For AMD’s FirePro customers, they know that with GCN coming up on 6 months old now that this is the time to keep an eye on product announcements. It typically takes AMD 6 months to a year to release a professional product using a new GPU – primarily for driver and software validation purposes – so they’re just now entering that window. Almost right on schedule, today AMD is announcing their first Graphics Core Next based FirePro product, the FirePro W600. However in an unusual move despite the FirePro name it’s not a professional card in the traditional sense. Rather it’s a professional card in the not-for-consumers sense. GCN’s first professional task as it turns out is going to be a brand-new FirePro subcategory: digital signage and display walls. In several respects digital signage and display walls are obvious markets for AMD. Fundamentally such functionality is based around Single Large Surface (SLS) technology, which AMD first gained in 2009 as their Eyefinity technology. 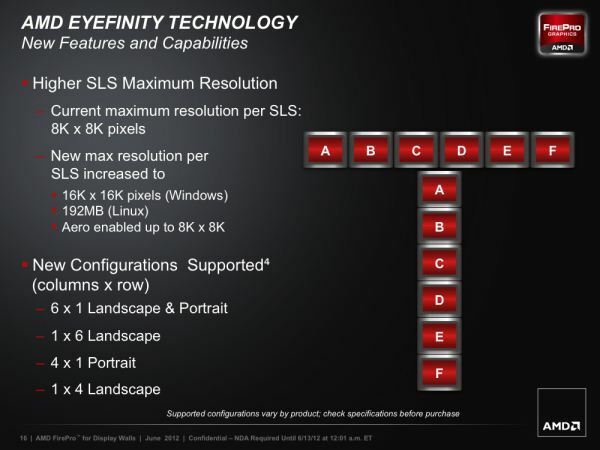 Since then AMD has had the basic capabilities necessary for this market for some time now and have continued to add functions to Eyefinity over the years. At the same time they’ve even casually chased after the much broader digital signage market with embedded products like the E6760, but this is the first time they’ve gone after display walls with a dedicated part. Fundamentally the W600 is a variation of the Cape Verde based Radeon HD 7750. It’s very similar to its consumer counterpart in most respects, but it has two key differences: it’s equipped with 2GB of GDDR5 rather than 1GB, and in place of a mix of monitor outputs it has 6 Mini DisplayPorts. As we stated earlier AMD is going for the many-monitors markets of digital signage and display walls, and in that market the name of the game is how many monitors can be driven off of a single card. With W600, AMD has built a card that can drive as many monitors as the Cape Verde ASIC can handle (6). But why GCN for the display wall market? As it turns out AMD has added several different features to GCN that prove useful for this market. While AMD’s previous generation Turks ASIC could support 6 DisplayPorts too, it had other fundamental limitations that GCN ended up resolving. The biggest of which here is that GCN supports higher Eyefinity resolutions than Turks; 16K x 16K under Windows (sans Aero) instead of 8K x 8K, which is particularly important for 6x1 configurations or configurations involving multiple 4K monitors (thanks to DP1.2). At the same time GCN also introduced support for Discrete Digital Multi-Point Audio, which again is of particular benefit for video walls. AMD is also touting GCN’s power saving features, but in this case that seems to be rather empty. ZeroCore Power and PowerTune are both present, but with digital signage it’s unlikely that the card will ever get to sleep in a way that triggers ZeroCore. Nor is it likely that the card will be used to run graphically intensive applications (AMD doesn’t even list 3D performance figures for the W600). But still, they’re there if customers need the functionality. Finally, AMD has announced one more software feature for GCN FirePro cards, a few months ahead of the feature’s planned Q4 launch. 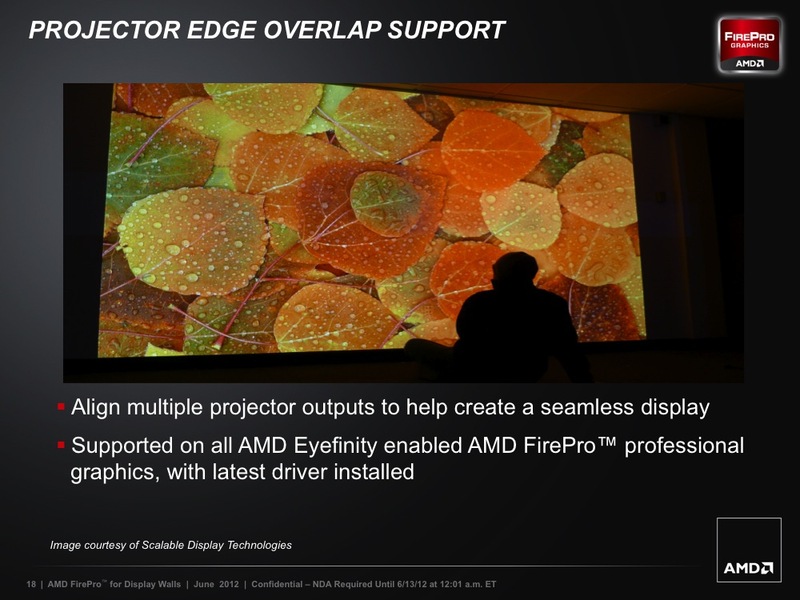 AMD will be adding support for edge blending and warping for projectors, which will greatly improve the ability to setup projectors in SLS configurations. Currently it’s doable, but it requires a great deal of care to perfectly align the projectors and it only works on flat surfaces. Edge blending will complement AMD’s existing projection overlap capabilities to make it easier to setup projectors in SLS (just set them up and let the software handle the fine details), while warping will allow for aspect-correct projection on curved surfaces. Wrapping things up, the W600 is available immediately, for $599. AMD’s primary competition here is Matrox, so they seem rather confident that they can quickly swoop in and take this market for themselves with their much newer technology. The crappy 7750 is $109+ to $159, and they want $1,500 for this modded piece of junk.